It all began in 1958 at 119 Clinton Street in a small store front restaurant on Wausau’s west side, with an eager young man everyone knew as Tony. Tony and Mary Perrella – natives of Minnesota – came to Wausau on a whim. Their goal was to serve Wausau and the surrounding area the best thin crust pizza around. They achieved that goal and then some. When you walked into Sam’s Pizza, you were, and still are, greeted with a friendly smile, and the aroma of freshly baked pizza. It’s the only place in town where you can watch a pizza maker assemble your pizza. Over the years the area grew and things changed. Never the product or the friendly smiles, only the location. In 1968 with the widening of the main thoroughfare to downtown, Sam’s Pizza moved to 111 Elm Street. With a new building came a larger facility but the pizza, the quality and the friendly smiles stayed the same. As time went on the business grew, with that growth, came long hours and more employees. One of their very dedicated employees was John Huber. John was a young, ambitious, eager and, like the Perrella’s, determined to serve Wausau and it’s area the best thin crust pizza around. John worked hard and diligent with Tony and Mary, his strive for excellence in pizza making and customer service paid off. After Tony’s death in 1982 , Mary sold Sam’s Pizza to John and his wife Lynn. The area kept growing, things changed, but never the pizza or the friendly smiles. Lori Heyne, Lynn’s sister, joined the staff in 1989 and currently is the general manager of the Elm St location. Looking to expand John and Lynn ventured to the Schofield area and opened their second location at 5811 Business Highway 51 South in 1992. The area welcomed them and their pizzas. As time has gone on, 60 years to be exact, stories from children growing into parents and then into grandparents line the walls of the two locations. That’s why “it’s a family tradition” for many current and former Wausau residents, it’s a consistent product and quality customer service that has keep Sam’s Pizza the tradition it is today. Working at Sam’s in the early 90’s, John and Lynn’s daughter Jodi and husband Vince knew that taking over for John and Lynn at time of their retirement was inevitable. Today, Jodi and Vince own both Sam’s Pizza locations. 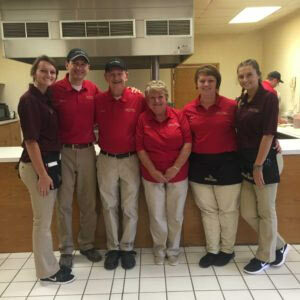 They are happy to be able to continue the family tradition, not only for their family, as both their daughters, Hannah and Emily worked at Sam’s, but for many families in the Wausau and the surrounding areas.